I received this BumGenius All-in-one diaper free with my BumGenius coupon and flip purchase from Abby’s Lane. The size medium I chose fits from 15-22 pounds. My little guy is about 16.5 lbs as of the day I took this photo. It fits him wonderfully with plenty of room to grow. These are a lot like the BG 3.0 O/S diapers. They have a stay dry inner. A stuffable pocket to add additional inserts. They have the same waterproof outer with front PUL “stopper,” the “poop scoop,” aplix closures, rear elastic…all the same great features except it has a sewn in microfiber soaker. 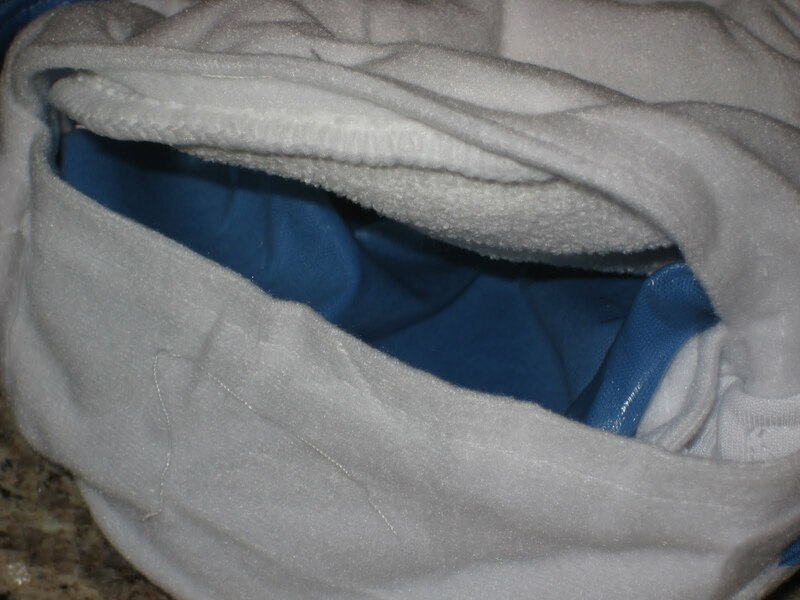 This is a photo of the diaper turned inside out, which helps it dry a bit faster. 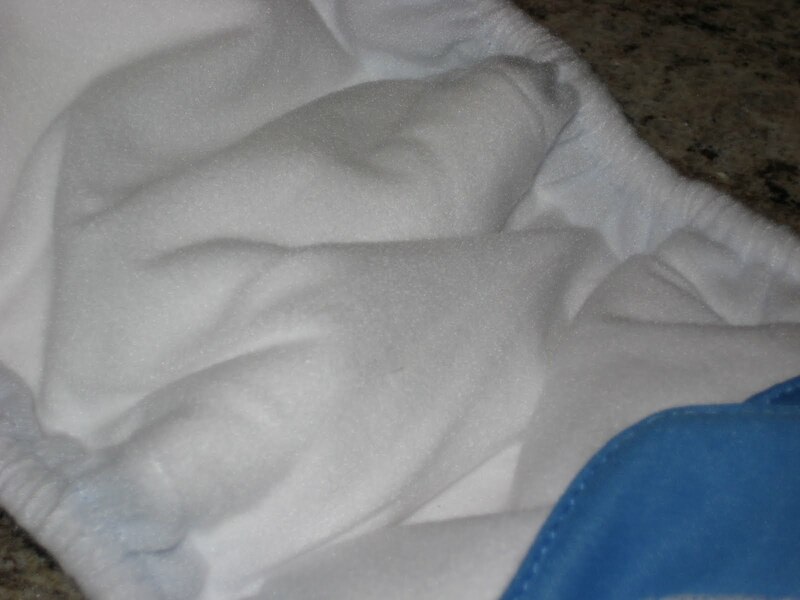 These diapers are sized, with the XS fitting from 6-12 pounds (no stuffable pocket on this one), S fitting 8-16 lbs, M fitting 15-22 lbs and L 22-30 lbs. This makes them even trimmer than the one sized diapers, and they are just as leak proof. They are priced at $15.95 each, which is $2.00 less than a Bumgenius 3.0 one-size pocket diaper. If money were no object, I would gladly exclusively use these. Since money IS an object for us, (a very scarce one at that) I would prefer the one size diapers. Aside from the cost issue, they would experience the same velcro wear over time (the organic AIOs come with snaps but not these, with the stay-dry inner). You’d also be unable to separately treat the microfiber insert if it needed some extra stink treatment, which would limit your options (bleach and other treatments can damage PUL). One person told me she actually removed the soaker from the diaper, which would “save” it, but then it would be a pocket diaper! The XS/newborn size diapers are priced at $3.00 less. I would definitely get a few of these to diaper a newborn! But for now, I’ll stick with my 3.0’s, though I’m so glad I got to try this! Edit August 2010: I still like this diaper; it is very trim and absorbent. However, it is getting a little stinky. If I turn it inside out to dry and sniff the microfiber, it doesn’t smell clean. I’ve had to re-wash it turned inside out several times.